Sheriff Fleet Service's primary goal is to provide a safe and efficient operation for our personnel at a cost savings to the tax payers of Fresno County. Sheriff Fleet Service's handle all fleet related functions such as the maintenance and repairs of our existing equipment which is performed in house with Sheriff's office personnel, or through preexisting competitively bided contracts with numerous venders in Fresno County. In 2003, the Sheriff's Fleet operation was transferred from under administration and management of the County's General Services Division to the Sheriff's Office. In addition to assuming complete management responsibilities of our fleet, the Take Home Patrol Vehicle Program was implemented as a pilot program. The benefit of control over our fleet has been cost containment, increase duty life of fixed asset equipment, improved response capabilities, enhanced utilization of personnel and improved customer service to the residence of Fresno County. Our fleet operation was highlighted by an investigative report prepared by the Fresno County Grand Jury in 2010/2011. The report highlighted our success through the years in meeting our original goals and objectives that were identified in 2003 when the fleet operation became our responsibility. Sheriff Fleet Service's other responsibilities include but are not limited to product testing, vehicle modifications, the salvaging of decommissioned vehicles that have been wrecked beyond repair or have been evaluated by our staff to be unsafe to operate in our fleet due to age, mileage or other associated factors, and the maintenance of all fleet related documents. Our fleet consists of 500 plus pieces of equipment which include numerous make and models of vehicles, off road motorcycles, ATV's, prisoner transport vans and bus, trucks, trailers, four-wheel drives, and miscellaneous vehicles used for specialized details such as E.O.D., S.W.AT., Dive, K-9, and Search and Rescue functions. 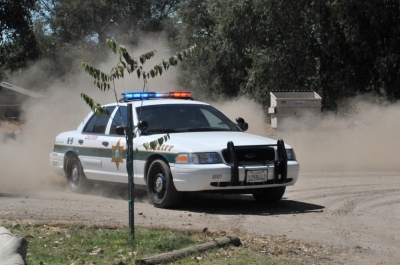 Sheriff's fleet vehicles traveled approximately 6.1 million miles last fiscal year. Challenges for the future include choosing a patrol vehicle for our future needs, rising fuel and parts cost, and shrinking budgets for vehicle replacements, and maintenance and repairs.